America seemed unanimously religious, but freethought, that seeming nineteenth-century relic, was already in the throes of rebirth. Given the continual, reliable failure of prayer, either God has little affinity for his creation or he simply does not exist. 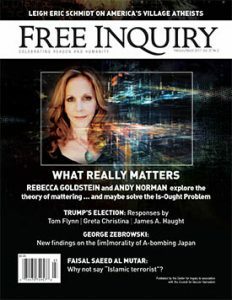 Letters in response to Free Inquiry volume 37, issue 1.